﻿Looking for the best place in San Francisco to host your San Francisco City Hall wedding reception? Look no farther than this list we’ve put together for you. 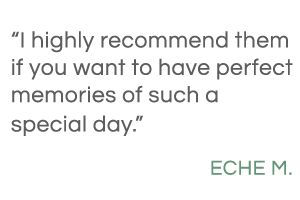 As SF City Hall wedding experts, we know how couples from across the globe or from across town celebrate their wedding day. Since the majority of these weddings include only a handful of guests, most groups like to head to a nearby restaurant after the ceremony. If you’re a planner like us, you’ll want to check out these spots ahead of time. 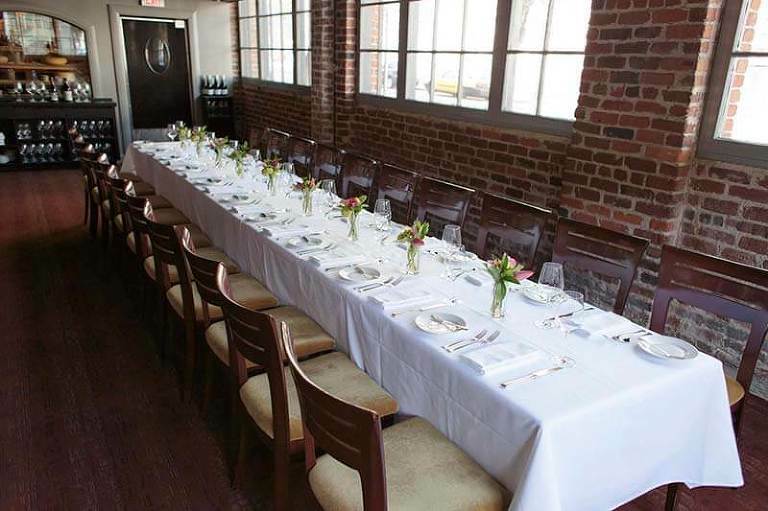 It’s always a good idea to call to reserve a table or a private dining room, depending on the size of your party. These five restaurants are sorted in order from closest to farthest from City Hall, not by the quality! (Although they are all close by – all are less than 2 miles away.) They all make fantastic choices for a San Francisco City Hall wedding reception, we promise. It depends on what you are personally looking for as far as decor, ambiance, dining room setting or style, and of course the cuisine itself. Jardinière is one of the closest restaurants to San Francisco City Hall. Plus, it boasts gorgeous private dining options for you and your guests. With a focus on local and seasonal ingredients, this upscale restaurant creates high-quality cuisine with romantic, chic surroundings. The Franklin Room provides a private dining experience with floor to ceiling platinum curtains. Or the curtains may be left partially open, granting a view of the restaurant’s elegant atmosphere. With multiple seating and table arrangement options, there is lots of flexibility in this space. This room, with its lovely exposed brick walls, also hosts Jardinière’s distinctive cheese cave! Contrasting with the larger, flexible Franklin Room is The Wine Room, a fully private room that Jardinière describes as “masculine and elegant.” There is a gorgeous exposed brick wall with a mirrored wall on the opposite side, which gives the appearance of a larger space. The other walls have wine cases encased into the walls. The entire effect of this decor is welcoming, rich, and warm, which is perfect for a smaller group. The Sommelier Table is actually made up of two tables, located in a secluded area in Jardinière’s main dining room. While seated in this space, you and your guests can still enjoy the warm, romantic ambiance of the restaurant. True to its name, The Sommelier Table is bordered by a gorgeous mahogany wine station filled with wines from around the world. Lastly, Jardinière offers the option to partially or fully buyout the restaurant for your wedding reception. This isn’t a popular option for the typically small City Hall weddings, but it bears mentioning for those who are hosting a traditional, larger reception after their San Francisco City Hall wedding. The restaurant hosts both upstairs and downstairs seating, so guests would be able to enjoy multiple areas of this elegant restaurant. Absinthe is an upscale French-Mediterranean restaurant that is perfect for City Hall wedding receptions. Not only is it really close to city hall, it has a romantic, fun atmosphere that is simply delightful. They boast unique drinks and cuisine that are unlike other restaurants in San Francisco. They even have a selection of drinks that are created using flambé techniques, while are always fun and dramatic to watch. Another unique feature of Absinthe is their private dining. Absinthe’s private dining room is actually a completely separate space; Absinthe Private Dining is located directly adjacent to Absinthe Brasserie & Bar. This space has its own entrance, dining room, bar, and restroom. Whether you choose the private dining room or elect to dine in Absinthe Brasserie & Bar itself, you will be treated to gourmet options with sizeable portions, fun drinks, and a delightfully warm, enticing atmosphere. The Pearl Room, one of E&O Kitchen’s many private dining areas. Photo Courtesy of E&O Kitchen. E&O Kitchen and Bar provides more dining options than any other restaurant on our list. E&O’s list of wedding dining options is located here, which we will now go through one by one. Entrance to Pearl Room at E&O. Photo Courtesy of E&O Kitchen. Located on the main floor, the Pearl Room is the newest and most intimate addition to the private dining options that E&O offers. The Pearl Room is separated from the rest of the restaurant by a carved antique wooden door. Once seated, you’ll enjoy the gorgeous walnut table surrounded by a Shantung Scroll wall covering. There is also a mounted television that’s perfect for a slideshow of the happy newlyweds. Private dining at the Loge at E&O Kitchen. Photo Courtesy of E&O Kitchen. The Loge is more open than The Pearl Room, as it’s located in the balcony above the main dining room. It also seats twice as many as The Pearl Room, allowing more flexibility in your guest list. The light atmosphere and fantastic cuisine create the perfect space for your SF City Hall wedding reception. E&O Room. Photo Courtesy of E&O Kitchen. This slightly larger room is a nice balance in E&O’s private dining options. Located with a unique view overlooking bustling Sutter Street, the E&O Room is a semi-private area on the mezzanine level. In this separate space, guests will enjoy each other’s company while partaking in the fun vibe of the rest of the restaurant. Cinnabar Room at E&O. Photo Courtesy of E&O Kitchen. 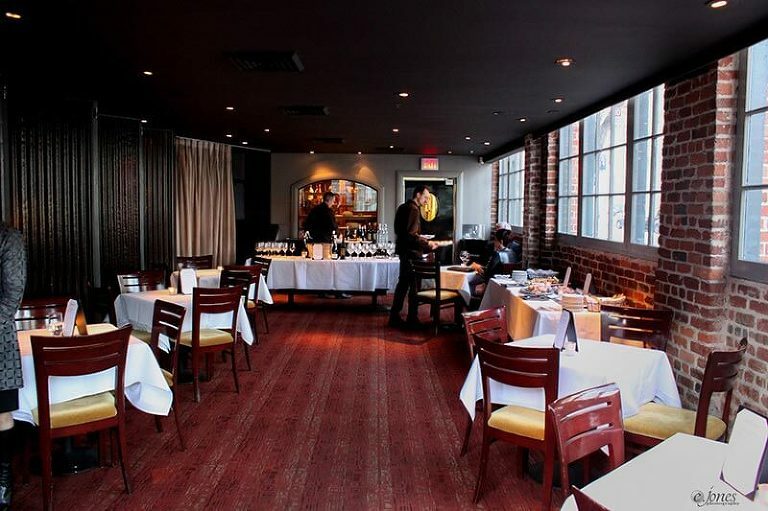 The Cinnabar Room is a completely private room located downstairs at E&O. Leather chairs, wood-beamed ceiling, and red walls create a comfy, elegant space ideal for wedding receptions. Conveniently located less than two miles from City Hall, Palio is a wonderful choice for your reception. Palio prides itself in its changing seasonal menu and authentic Italian cuisine. They also ensure that their 30+ years legacy thrives, as they recently remodeled the entire restaurant and their website. They have three beautiful spaces available for weddings. Their San Pietro Room is their most popular private dining option for lunch and dinner. The recent renovation retained the floor to ceiling windows that fill this space with natural light. This is their largest private dining room, seating up to 50 guests, and is fully private. Adjacent to this space is a private outdoor patio that makes for a wonderful addition to your gathering. This room is quite versatile, with multiple dining and seating options, making it perfect for many San Francisco City Hall wedding receptions. If you’re looking for a small space that is fully private, The Bakery is a great choice. Like the San Pietro Room, this space is located at the back of the restaurant and is fully private. It is also adjacent to the private outdoor patio. The Bakery seats up to 20 seated guests at one long table, so it is perfect for small civil ceremonies with a limited number of guests. Campo del Palio is a lovely, large area in the restaurant for larger groups. This versatile space allows for either 100 standing guests, 80 seated for a meal, or 60 for a reception plus a meal. Palio has re-imagined this space to make it as flexible as possible for different sizes of groups. It’s worth checking out if your San Francisco City Hall reception ends up on the bigger side. Along with the redesign of most aspects of the business, they’ve published a lovely guide on their private dining options. Click here to view the PDF. Wedding at Wayfare Tavern. Photo courtesy of Wayfare Tavern. Fine dining and traditional American comfort food merge at Tyler Florence’s flagship restaurant, Wayfare Tavern. The menu changes often so be sure to check their website for their latest offerings. You’ll find dishes ranging from unique salads to fried chicken and even lobster at this fun yet classy restaurant. Let’s start with the first private dining room that you’ll discover in Wayfare Tavern: The Billiards Room. Located on the second floor, The Billiards Room is the smallest of the three rooms as it only seats 10 to 16 guests at its pool table that converts into a gorgeous wood top dining table. 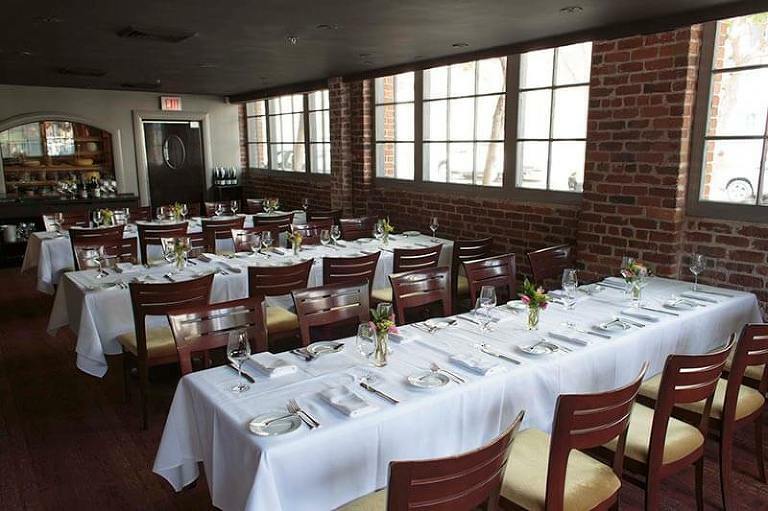 This convenient size makes it perfect for a small private lunch or dinner after your city hall wedding! Located on the third floor, The Bartlett Room provides the most space and versatility of the three rooms. Tables can be placed either end to end for a kings table or arranged throughout the room to seat up to 70 guests. There are other desirable features including a sound system, large TV, and the option for a bar setup. The Sequoia at Wayfare Tavern. Photo courtesy of Wayfare Tavern. While both The Billiards and Bartlett Rooms are gorgeous, The Sequoia is the room that Wayfare designed to impress a small crowd. Located on the fourth floor, Wayfare made sure that this room took advantage of its location and history in every way possible. An old vault was located on this level, so they transformed it into a private dining space within the room itself. The full bar is also quite impressive and perfect for a reception, and the versatile seating accommodates up to 50 guests. The highlight of this room is its incredible skylight view of the Transamerica Pyramid. Wherever you choose to dine at Wayfare Tavern, you won’t be disappointed. For a full look at all the options available, visit the private dining page of their website.